The HDBaseT v1.0 balun provides a single UTP category 5e/6 cable solution to deliver pristine digital signals from all HDTV formats and signal sources from 480i/p to1080i/p, 4K x 2K 60hz. 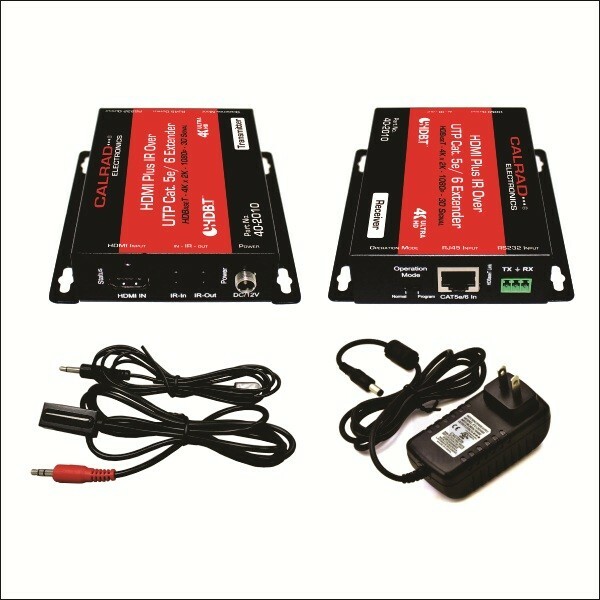 Provides bi-directional IR and RS232 support with POC to the receiver for a single cable solution. Option 1, 3rd party IR interface control and connectivity. Option 2, stand alone IR receiver and emitter solution. Send IR control signals from any 3rd party automation systems bi-directionaly using Calrad’s optional 40-IRC3 interface cable see Option 1 IR connectivity below. L.E.D. 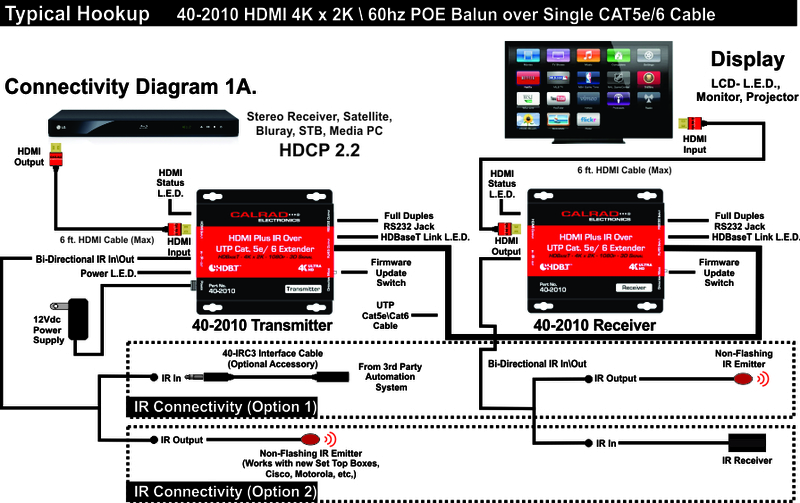 indicators provide reference for Power, HDMI signal status, HDBaseT UTP cable signal reference. See Typical Hookup, Diagram 1A below for connectivity details. Signal transmission distances may vary and are dependent on manufactures individual HDMI specifications and the quality and type of UTP cable used. All products should be fully tested prior to committing to a UTP Cat5e, Cat6 solution and running long runs of cables inside walls, possibly compromising your installation. All UTP wiring and RJ45 connectivity start to finish should be certified to 568A or 568B standards and tested before connecting the Transmitter to the Receiver. Warning!!! Since HDBaseT standards use (POH and POC) power connectivity, damage may result to both the Transmitter and Receiver if inconsistent or improper wring are used and standard UTP wiring and termination is not followed from start to finish. Failure to follow proper connectivity will void the warranty on this product. For further technical assistance or questions regarding connectivity and termination or for IR control related configurations or IR specific questions, please contact our technical support department, Tel: (323) 465-2131, M-F 8:00 am to 4:00 pm. IR Receiver IR Emitter Cable Length’s: 3 ft.